The watch sports a 42 mm circular case in black along with a 20 mm interchangeable black band. In the huge clutter of smartwatches, this one stands out as a perfect blend of looks and performance. The watch sports a 42 mm circular case in black along with a 20 mm interchangeable black band. It has a bright and circular touch display at the front and is protected with a layer of Corning Gorilla Glass DX+. There is an always-on option that prevents the display from going into the sleep mode and continues to show the watch face in the same way traditional analogue watches do. When turned on, the touch sensitivity option can be used to operate the watch even if you are wearing gloves. There are two keys on the right for easy access - the top one takes you to the previous screen and the secondary key is used to access apps/watch faces or to turn the watch on/off. Also, the bezel around the display rotates to help with quick navigation across apps, notifications and widgets. Rotating the bezel clockwise from the watch face showed different widgets and turning it anticlockwise showed notifications. 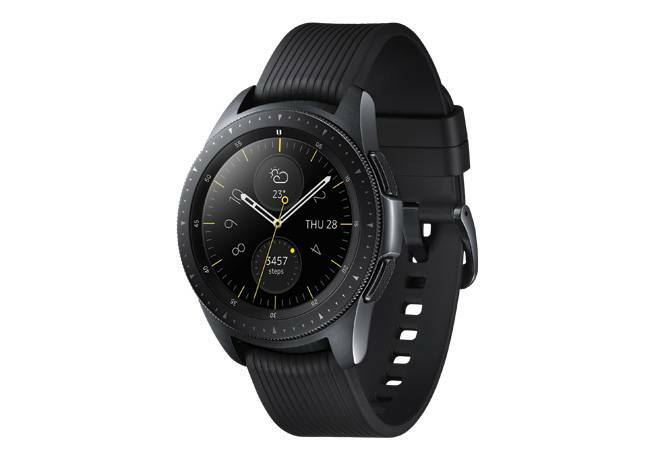 The Galaxy Watch runs on Samsung's Tizen operating system and has a neat, intuitive interface. It took me less than five minutes to configure the watch with the Galaxy Wear app, a comprehensive one featuring all relevant information. Plus, it gives access to a lot of watch faces - both free and paid - to go with every occasion. When connected with a smartphone, it will also fetch e-mail, text messages and WhatsApp notifications in real time. I preferred to read my e-mail on the smartphone but often replied to WhatsApp messages using the preset replies and on-screen keyboard on the watch. When it comes to health and fitness, the smartwatch automatically tracks footsteps, the number of floors climbed, heart rates and more, all neatly presented in a widget. It can track a wide range of activities such as running, walking, cycling, hiking, swimming, crunches, yoga and exercise on an elliptical trainer/step machine. It detected a spike in my heart rate and automatically recorded the number of steps and calories burnt during a morning walk. I also liked the inactivity alert that suggests some light workout such as torso twist, upward stretch or squats after one has been inactive for an hour or so. The watch also measures the stress level and it turned out to be neutral every time I tried it. But the best part of this gadget is the battery backup. The watch comes with a wireless dock for charging and a full charge, which took close to three hours, lasted me more than three days. The long-awaited MacBook Air has finally arrived with a full makeover, which is bound to please Apple lovers. But the price this time is quite high. The unibody shell is made from a single block of 100 per cent recycled aluminium, it sports a look and feel on a par with the iconic MacBook Pro. Moreover, the new golden hue (it is also available in space grey and silver) looks stunning, a darker tone instead of the shimmery kind, which reminded me of the rose gold iPhone 6S Plus. Weighing 1.25 kg, this one has the thinnest-ever chassis, and the wedge-shaped design is still there, tapering off to 4.1 mm at the thinnest point. Apple has done away with the aluminium bezels and adopted a glass screen running to the edges. The sides are also done in black. You also get two USB Type-C ports (Thunderbolt 3) on the left, a 3.5 mm headphone jack on the right, a third-generation 'butterfly' keyboard with individually lit keys, two strips of speaker grilles on each side of the keyboard for immersive sound and the new pressure-sensitive Force Touch Trackpad. Two Type-C ports might feel too few, considering that one will be used for charging. However, the 30W wall-charger bundled in the box juiced up the Air's battery in a couple of hours and lasted over eight hours as I did web browsing, documentation, video streaming and editing - a full day's work. Everything appears sharp and vibrant on the 13.3-inch Retina Display with 2,560x1,600p resolution. The viewing angles have improved; the new Air displays 48 per cent more colours compared to the previous models. The backlit keyboard was super comfortable to type on, even at night. On the top right corner, next to the F12 key, is the TouchID sensor for unlocking the MacBook, accessing password-protected documents, folder and more, without entering your password. Swiping fingers (often known as gestures) on the big trackpad also makes it easy to navigate. Better still, Force Touch will help you access more options based on subtle differences in figure pressure. Under the hood, Apple has put a 1.6 GHz dual-core, eighth-generation Intel i5 processor, which is fast and energy efficient. 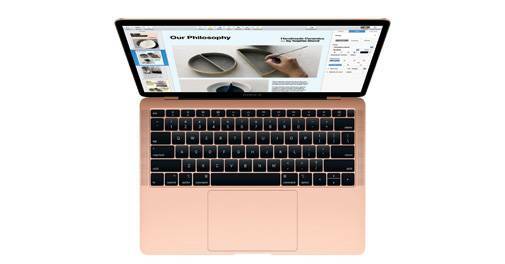 Our review unit was an entry-level device and came with 8 GB of RAM, 128 GB SSD, and the latest macOS Mojave, specially designed for the Mac range. I was able to use it for multitasking, gaming, editing images and videos, on the move. The T2 security chip encrypts data and ensures secure booting. It also has three microphones for enhanced conversations with Siri, which I used for searching documents, launching applications and loading a website on the Safari browser. And Air did not slow down on a single occasion. But if you are looking for more power, go for a MacBook Pro.